A while back I purchased the much praised Cookie A. book, Sock Innovation. No surprise, I ordered it in April and didn't receive it until June... always my luck with ordering online. However, this book was worth the long wait. It is jam-packed with uber socks to knit! Pick up this book if you like complicated, intricate, amazing designs. Don't get this book if you like simple socks that don't involve thinking. 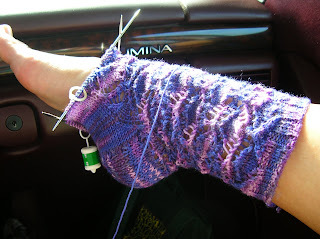 Don't worry, I'm not knocking it, because after these babies I'm going to have to simmah down and knit 2 or 3 plain jane socks! It's taking me a long time to knit these. So not my typical weekend sock. But very much worth it. I'm using Lorna's Laces (surprised?). I'll give more details once I'm done... Just wanted to give you guys a little peep show (The pattern is here)! All sorts of beautiful are on your foot there. Awesome work. You're right about not being mindless knitting. I'm working on a pair, too,put it down for quite a while because I was too busy, I'm already past the gusset, but now i don't have a clue what row of the chart I'm on. how are you finding the sizing? my St. St. gauge matches, but I've never made a sock with only 6o-something stitches. I had to increase sts on the model I'm making. Your yarn is sooooo pretty. 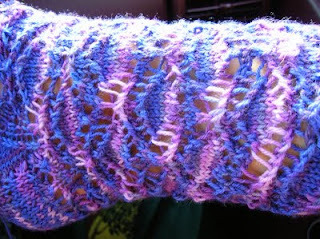 I love the lace pattern and the yarn is amazing.